We’ve been building room for your stuff since 1984. Our new slim shed is the perfect storage solution for smaller yards or those working with an HOA. Plus, it qualifies for our Rent to Own program! No other portable building or shed manufacturer can offer our Lowest Price Guarantee because no one builds a storage shed like Cook. If the pressure treated lumber in your Cook Portable Warehouse is ever damaged by fungal decay or termites, Cook will replace it free of charge. Our no strings Rent to Own program allows you to have your storage facility in your own backyard or business right where you need it. All of our sheds are built in a quality controlled environment and delivered directly to you fully assembled, set up and leveled. If you already know what you're looking for and are ready to start the buying process, click below to get started! “Hi! I purchased a portable warehouse from y’all in August, that was finished off on the inside and had electrical, etc – and I had stated that I wanted it for opening a small photography studio! Was just letting you guys know that we completely transformed it back in August! We painted, put new floors, the whole nine yards. Thanks again, I LOVE it and couldn’t be happier.” Corinth F.
Convince Your Spouse You Need a Shed! You may know you need a portable building, but sometimes your partner may need a little convincing. 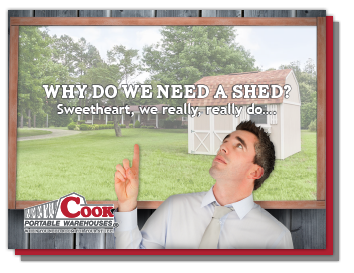 Download this free presentation and have an honest conversation with your spouse about the benefits of a shed.